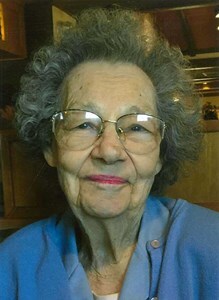 Virginia M. Parsons passed away on March 22, 2019, at age 95 in Casper, Wyoming. She will be deeply missed by her family and friends. in 1942. After graduation, Virginia worked as a secretary and receptionist for several companies in Omaha, including KOIL radio. The highlight of her early career was living and working for a radio station in Manhattan, New York, for about a year. She also spent a short time working in Chicago, Illinois, before returning to Omaha to help care for her mother after her parent’s divorce. anywhere, never driving slow and driving until she was in her early 90’s (scary). Her car and the freedom it provided her were special to her and were never taken for granted. California with her brother Jack and his family. Virginia held several clerical positions in Casper before becoming a nursing assistant at Natrona County Memorial Hospital where she worked until she retired. Virginia moved to St. Anthony’s Manor in April, 1981, and lived there for almost 38 years, until March, 2019. She was very social and enjoyed visiting with her many friends at St. Anthony’s Manor. Virginia also enjoyed many activities with her close friends, Rita, Winnie and Diane and the volunteers and caseworkers that provided support and friendship. unconditional love and support to her family. She did not need much to be happy, was quick with a smile and a kind word. Family and friends were her life! She was easily teased because of her good nature and could laugh at herself better than anyone. The comments we heard most often from other people were: “I just love your mom!” and “your mom is a real character!” Nobody that met her, easily forgot her. Virginia was a cancer survivor twice but lived all of her life with few aches and pains. She lived her last 5 years with a poorly functioning aorta valve that did not slow her down until the very end. Virginia was preceded in death by her parents, Robert “Ernie” Cateron and Ethel Cateron, 2 brothers, Jack and Warren, and a daughter, Barbara Parsons. Survivors include her other children, Greg Parsons, David Parsons and Janet Norton; her grandchildren Joy Parsons, Austin Liesse, Shane Parsons, Justin Parsons, and Jessica Alexander and her husband Brandon; and her great granddaughters, Briana Parsons, Riley Alexander, and Bryer Parsons. Brooke Alexander, soon to be her 4th great granddaughter, is due on April 26, 2019. Virginia’s family would like to thank her many friends, volunteer helpers, caseworkers, doctors, and the organizations that helped her continue living independently at St. Anthony’s Manor. Memorial donations in Virginia’s memory can be made to Meals-on-Wheels, Casper, Wyoming; Central Wyoming Senior Services and Central Wyoming Hospice Program. No services will be held. Friends and family may leave their memories and condolences by click the "Share Memories" button above. Add your memories to the guest book of Virginia Parsons. I'm sorry for your loss Greg, David and Janet. I remember going to Aunt Virginia's house in Omaha when I was a child to visit the family. She was always such a sweet lady. I'm sure my dad Warren, Jack and her have a lot to talk about. I delivered Meals on Wheels to Virginia for five years. Seeing her was the highlight of my day. I loved her laugh and sense of humor. I made her a yellow blanket one year and she reminded me every Friday that she loved it and used it all the time. One day she answered the door all wrapped up in it. She made me feel like the blanket was very special and that's how she lived her life. She was wild and crazy sometimes and if I told her that she would laugh her adorable laugh and all was right with the world. I will miss her so much. Will be missed by all , such a Sweetheart!